Band plays a loose set to please the faithful. About four minutes into Radiohead's wide-ranging set Wednesday night at San Jose Arena, with Thom Yorke po-going through "15 Step," ponytail (!) flapping back and forth from his Joshua-Tree era vest to his familiar stubble, the crowd had to wonder if he got his dates wrong, and thought he was already at Coachella. Just two days away from the start of the gigantic festival, Yorke was happily loose on stage at the Arena, taking the limitations of such a big cavern, and turning it into a loose-limbed dance floor. All the better for a set heavy on the band's newest release, "King of Limbs," which stays muffled through the entire album. Hearing those songs, like the concert opener "Bloom," "Little By Little," and "Lotus Flower" live, brought the album to life -- much like the well circulated Earl's Court show did for the already strong "Hail to the Thief" songs. As always, a Radiohead show is a preach to the choir affair, and the band's fans were hooked from the opening notes. 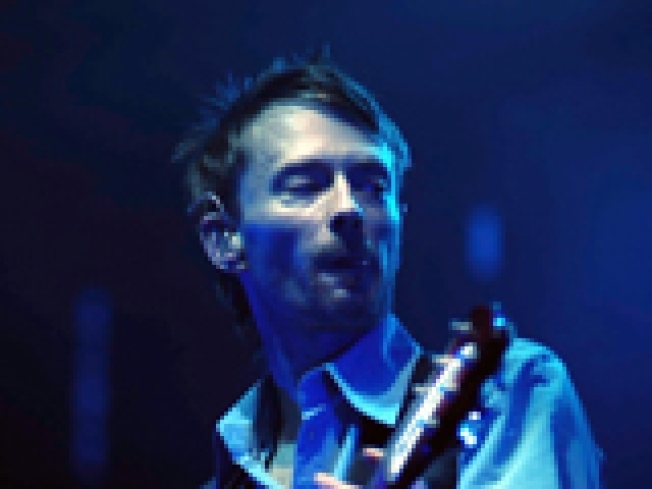 While still willing to experiment with new material, the fan favorites, from OK Computer's "Karma Police" to the more recent "Mixomatosis," from "Hail to the Thief," had the crowd -- and it keeps getting a bit older, along with the band itself -- dancing and singing along. While any show from this band is going to be catnip to smartphone waving Silicon Valley types -- a highlight was the giant video screen turned equalizer as the band muscled through "The National Anthem" -- there were still glitches, reminiscent of the equally swagger-ful Outside Lands tour in 2008. This time, two of the front video screens scrambled, then went dark early in the show. It turned an attraction into something of a distraction. That aside, I doubt many people noticed the screens, because they just couldn't take their eyes off Yorke, flipping and pumping his arms like a lead singer half his age. It wasn't the free-flowing venue the band is on its way to playing; but with his banter, dancing, and powerful band behind him, Yorke briefly turned a cavern into a dance floor. By the time Radiohead closed with back-to-back rips through "Planet Telex" and "Idioteque," he, and the fans, seemed sweaty and satisfied.